For several years, 3D NAND flash memory has promised to bring improvements to the performance, endurance and cost of SSDs. Samsung was the first to deliver 3D NAND and they have dominated the market ever since with the fastest consumer SSDs and the highest capacities. Last year, Intel and Micron shipped their first generation of 3D NAND and started providing stronger competition for Samsung in a few market segments, but price improvements were forestalled by the onset of an industry-wide shortage of NAND flash memory. Meanwhile, Toshiba, Western Digital/SanDisk, and SK Hynix talked a lot about their 3D NAND technology but shipped very little. A few memory cards and smartphones last year used 3D NAND, but Toshiba's first SSD with 3D NAND didn't enter mass production until around the beginning of this year, and it was a low-volume niche product. Toshiba's 3D NAND, now in its third generation, is finally ready for primetime. Their first SSD based on their 64-layer BiCS3 3D NAND is the XG5 client NVMe SSD for the OEM market. Using their 3D TLC NAND, the XG5 is intended as the successor to both their XG3 and XG4 SSDs, which use 15nm planar MLC and TLC respectively. The trend of replacing planar MLC with 3D TLC is widespread across all segments of the SSD market, even for high-end enterprise SSDs. The general consensus has been that the extra capacity of TLC can make up for its performance disadvantages once the switch to 3D NAND has reduced those disadvantages. In the client space, the use of SLC write caching completely eliminates the penalty to write performance provided the workload's writes fit in that cache. Overall, Toshiba's decision to make the TLC-based XG5 their high-end OEM NVMe offering is no surprise. The XG5 was first teased by Toshiba in May and was officially announced for Computex. The XG5 seems to have been the first 64-layer 3D NAND SSD to start shipping, but since it is an OEM product working its way through the suppy chain, it is still hard for consumers to acquire. Intel launched their 64-layer 3D NAND with the SSD 545s at the end of June and it managed to be the first 64L 3D NAND with retail availability. Since then, Western Digital has also announced their first 3D NAND SSDs, Toshiba announced their first retail 3D NAND SSD, and today Toshiba is announcing the rest of their OEM client 3D NAND SSDs. SK Hynix is still pretty quiet, but otherwise the SSD industry is finally reaching the point where most products will be based on 3D NAND. Planar NAND won't disappear for quite a while, but as production of 64L 3D NAND ramps up most brands will introduce their most significant product updates in years. The Toshiba XG5 is intended to ride the wave of increasing NVMe adoption by OEMs. It uses the single-sided M.2 form factor preferred for notebooks and offers capacities from 256GB to 1TB. Higher capacities would be possible using this 3D NAND, but given the current shortage they would be too expensive for most consumers. The controller supports a PCIe 3.1 x4 link and complies with version 1.2.1 of the NVMe specification. Based on the chip markings (TC58NCP090GSD) it appears to be an updated version of the controller used by the XG3 and RD400 (TC58NCP070GSB), with a switch from plastic packaging to exposed-die flip chip packaging. The die size is approximately 39mm². The only performance specifications provided are for sequential transfers, but they're pretty aggressive for a TLC-based SSD. Toshiba wants the XG5 to cover a broad portion of the OEM SSD market. Toshiba's 1TB OCZ RD400, the retail counterpart to the Toshiba XG3. 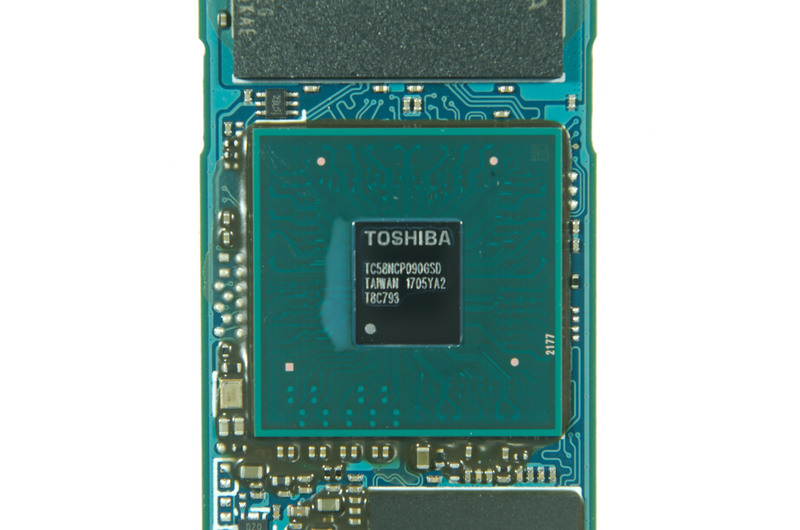 The RD400 uses Toshiba's 15nm planar MLC NAND. 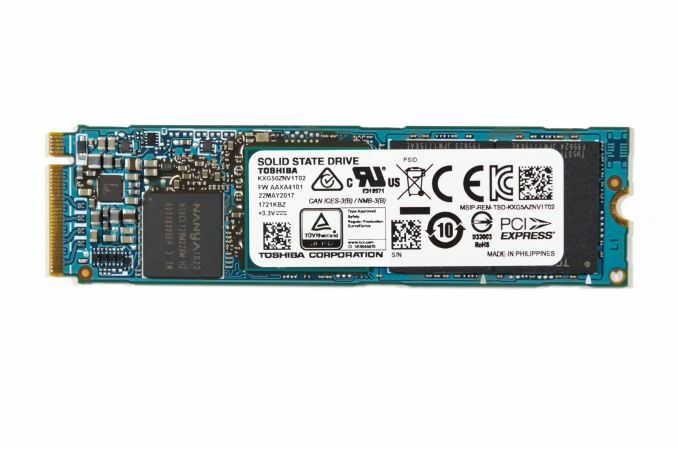 Western Digital's 512GB WD Black and Intel's 512GB SSD 600p These are the cheaper TLC-based NVMe SSDs already on the market. The WD Black uses SanDisk 15nm TLC and the Intel 600p uses 32-layer 3D TLC NAND. Plextor M8PeY 512GB and Patriot Hellfire 480GB: Two NVMe SSDs using Toshiba's 15nm planar MLC with Marvell and Phison controllers, respectively. They have generally been cheaper than Toshiba's OCZ RD400.